Embracing the ever-changing technological advancements available today for students is high priority at Bakewell and pave the way when implementing innovative learning programs at the school. The leadership team at Bakewell Primary School and Principal, Paul Nyhuis see great advantages of equipping students with the tools they need for 21st Century learning. Embracing the ever-changing technological advancements available today for students is high priority at Bakewell and pave the way when implementing innovative learning programs at the school. The 1:1 iPad Learning Program at Bakewell is designed to motivate and inspire the students through learning experiences requiring investigation, creation, communication and working collaboratively with their peers. It also allows for greater individualised learning, increasing independence and encouraging self-initiated learning beyond the classroom. The program will broaden in 2018 from the existing Years 4 and 5 students to include all Years 3 and 6 students. 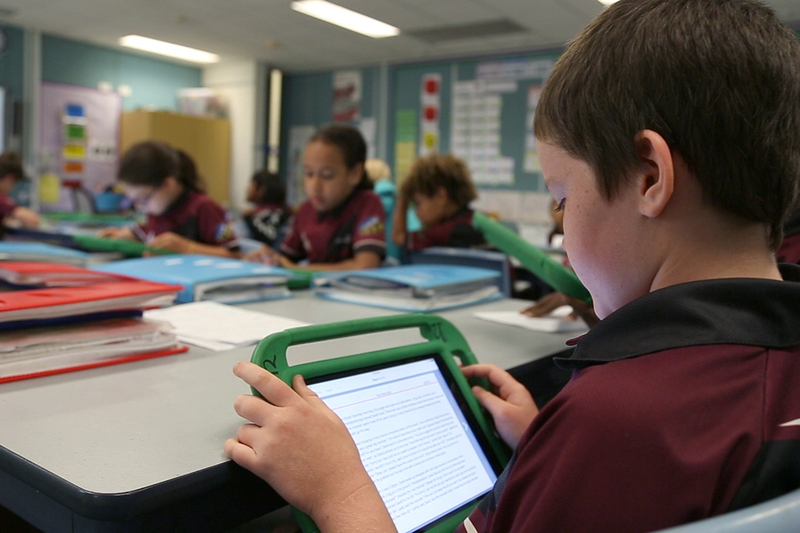 Students in those year levels will have access to an individual iPad for learning within the classroom. There is also opportunity for students to take the device home (during the school year). The program provides opportunities for students to develop Information Communication Learning Technology (ICLT) capabilities and enhance their learning. There are many opportunities for students who have been identified as excelling academically to take part in explicit learning programs that enhance and extend them to become confident, capable and successful learners who are independent and set themselves rigorous academic goals. The opportunities are endless and Bakewell thrives on seeing their students excel. Bakewell fosters International Partnerships that have a positive impact on a range of areas of student learning and professional development for staff. Embracing cultural understanding and global mindedness, Bakewell Primary has partnered with Tunxilu Primary School in China and also recently visited Rentau Primary in Timor Leste and established a partnership. Bakewell Primary has expanded and strengthened the Chinese Languages Program with all students in Years 5 & 6, participating in weekly Mandarin lessons. Susan Zhang, a teacher from China, joined Bakewell on a teacher exchange program and is offering introductory Mandarin lessons for students in some classes Years 2-4. Bakewell is committed to ongoing school development and are consistently creating learning experiences through innovation. Bakewell Primary accepts students from Preschool to Year 6 from the surrounding suburbs of Bakewell, Johnston and Gunn. With unlimited possibilities and a focus on positive relationships and high expectations, Bakewell Primary promotes a community that is respectful, professional, inclusive and safe. For more information visit www.bakewellprimary.nt.edu.au or contact the front office on 8997 7400.